"The following is a guest review. The review and photos do not necessarily reflect the opinions of Michael Crawford, Captain Toy, or Michael's Review of the Week, and are the opinion and work of the guest author." 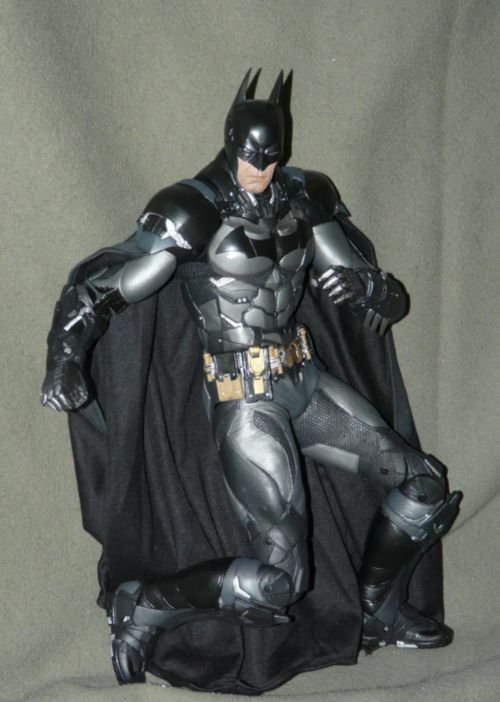 There have been a plethora of Batman figures produced over the years, and almost none of them have been very good. Arguably it all started with Ideal and their Batman costume for Captain Action, followed relatively quickly by Mego's Batman figure in their classic 'World's Greatest Super Heroes' line, both great figures for their time, and classics today. But that was followed by the awful doldrums of the "we've never met a five points of articulation figure we didn't love" Kenner years. Those figures, while often well-sculpted, pretty much sucked. And we won't go into the "blaze orange Batman" variants, packed with extreme sports equipment. Bleah. Things have gotten a bit better of late. There's been any number of six-inch Batman figures worthy of note in the past dozen years, some on the mainstream pegs, some at specialty shops. Some of them have come *this* close, but they keep missing the mark. Hot Toys and Sideshow have really upped the game in the 1/6 scale market. 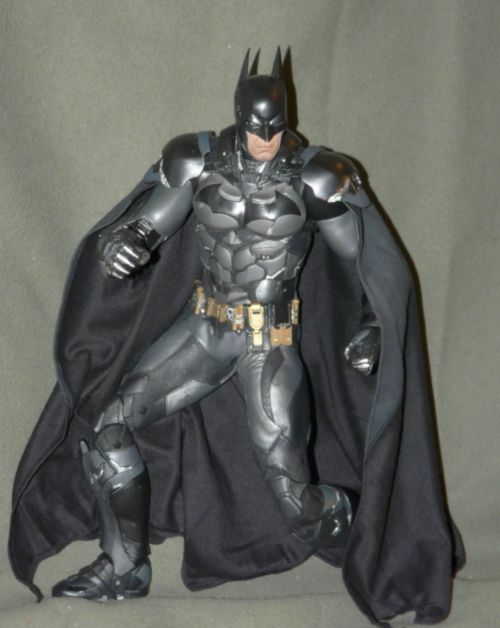 However, other than the recent Sideshow "Dark Knight" Batman, most have had movie-accurate costumes that severely limited the figure's articulation. And then NECA entered the room. 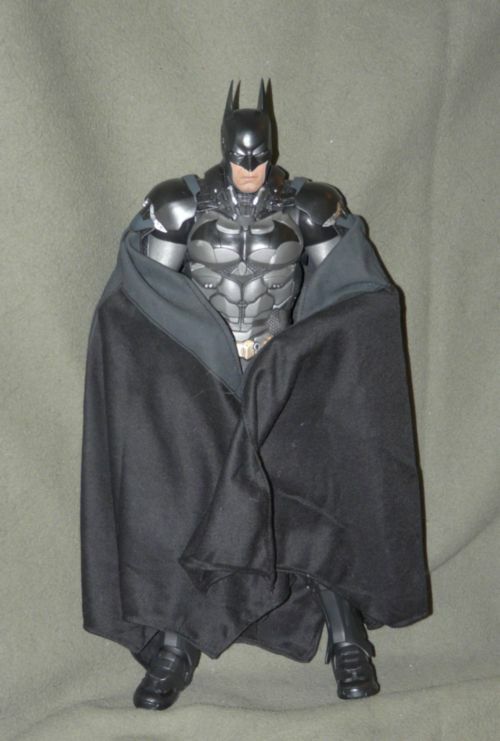 Somehow they managed to sneak a license for Batman into their quarter-scale line. Initially these were sort of vaguely articulated statues, of little interest to an action figure collector. Yet somewhere along the way a decision was made, a memo was sent, and articulation was added. And lo, did wonderful things ensue. He comes in a very nice window box, excellent graphics, relatively durable. He's held in by any number of twistie ties so have the wire cutters handy. His cape is folded up and tucked behind him to stay out of the way. The accessories are in a taped-in blister pack off to the side. Whatever. Why would you care about the box? Having seen NECA's previous quarter-scale Batman figures you'd have high expectations for this aspect, as they've set it in the stratosphere and continue to make attempts to vault it. And on this figure they've simply launched a Saturn V. They've knocked it right out of the park with something that looks as if it walked off the screen and into your lap. The suit Mr. Wayne wears in the 'Arkham Knight' game is perhaps one of the most detailed to date. And they've brought forth every jot, every tittle, every tiny little detail in superbly incised form. You'll spend hours simply poring over all of it, running your fingers over the different textures, lumps, bumps, and structures. You simply can't take it all in the first time you unpackage him. 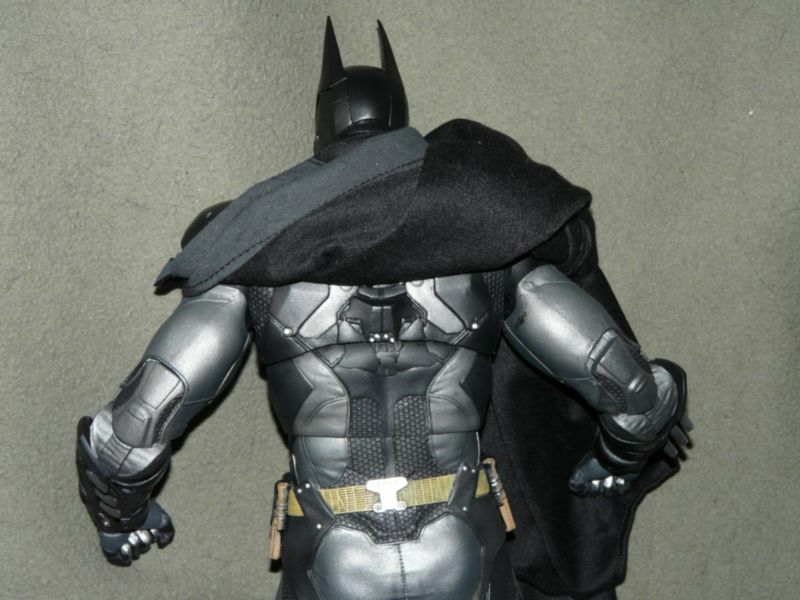 He's also detailed on his back, under the cape. And as I said, screen accurate. They really got it right. If there's a nit to pick it's this; unlike the 10" Play Arts Kai version, they did not sculpt a concavity underneath his armpits, which means he can't quite bring his arms down to their sides. This is the sort of thing I only noticed due to the aforementioned PAK version having it. Still, it doesn't bring it down even 1/2 a star. I have checked this figure over multiple times from stem to stern and there simply ain't no paint errors, period. They've used gloss and matte black paint where appropriate, adding weathering where it's needed. The detailing on the eyes and face is of a level I'd expect on a high-end statue, subtle yet powerful. This is a figure with pretty complex paint ops, and they get it absolutely correct. I simply can't understand how they do it. Folks, what we have here is an 18" Marvel Legends figure, period. You have a ball-jointed neck (which sadly really only rotates), ball shoulders, three-point ball chest/waist, double-hinge elbows, rotate forearms, ball wrists, ball hips, double-hinge knees, and ball ankles (which are alarmingly tight; I really haven't done much with them). The hip area, rather than being solid plastic, is a soft vinyl, allowing for a minimum of gap while allowing maximum articulation. The majority of the joints are clicky, so he doesn't become floppy. Curiously, his shoulders are more than a bit loose, but perhaps only in relation to the tightness of the rest of the joints. And there's that neck, perhaps a bit too short and definitely too tight. The PAK has it all over this one in looking up and down. All of the articulation is very well-integrated into the figure, much more so than many of the early Marvel Legends figures. The detailed bat-armor simply hides it very well and they've taken advantage of that. Still, if you don't have fun posing this guy, then you've obviously grown up entirely too much. I've checked out several of NECA's quarter-scale figs, and have witnessed how they've slowly but surely been improving the articulation. And on this Batman fig they've reached a sort of nirvana. Good job! 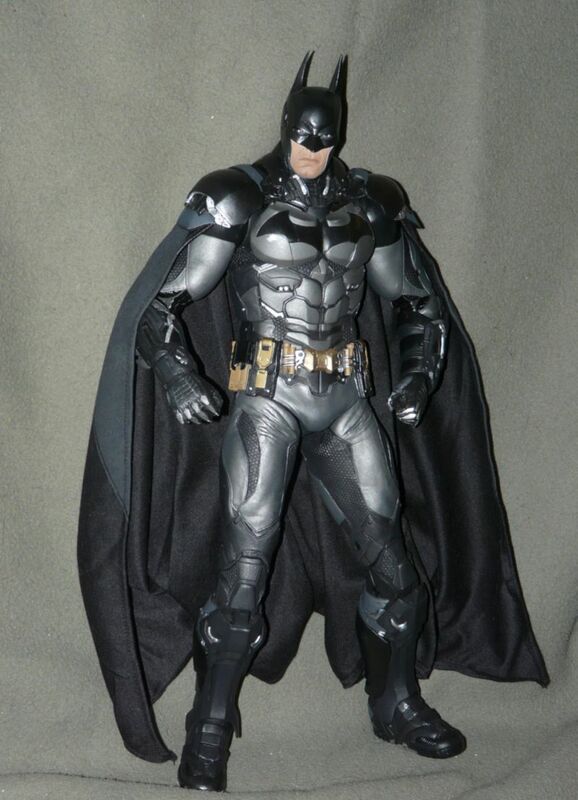 He comes with alternate hands, his grapnel gun (with removable grapnel), and a batarang. Completely appropriate to the game. Yeah, I am embarrassed to say that I have yet to remove them from the box, even after having him for over six weeks. He is so cool with just the fists I haven't felt the need to bother. But he comes with everything you'd want him to come with. And it's well-detailed and painted, just like everything else on this spectacular figure. Okay, it's just the cape, but they did it up right. It's made out of something like a t-shirt fabric, but hangs and drapes beautifully. It's hemmed all the way around, even the bat scallops. And there's silk-screened detailing on the back, just like in the game. And, honestly, that's something I barely noticed until I got this figure. They were not mucking around here! What's not to like? Scale-wise, he's the same size a 1/6 scale figure would have been to me when I was seven-years-old. Every time I pick him up I feel like the luckiest kid in the world. For $100 you could get five SW Black figs, five of the lets-reuse-the-same-buck-over-and-over Marvel Legends figs, an exclusive three-pack or two or... this. Honestly, given the garbage we're routinely served for $12 and up at retail, I honestly felt like I was ripping NECA off here. This figure weighs nearly five pounds. FIVE POUNDS! You could probably use him for home defense if necessary (especially as sharp and pointy as his ears are). This is something of a grail figure we're looking at right here. It's taken and built upon their previous quarter-scale figures (especially their assorted Batmans) and come up with something demonstrably better. The only thing that would make this figure better? If it were 1/6 scale. Seriously, Hot Toys needs to get on this bandwagon for their Batman figures. 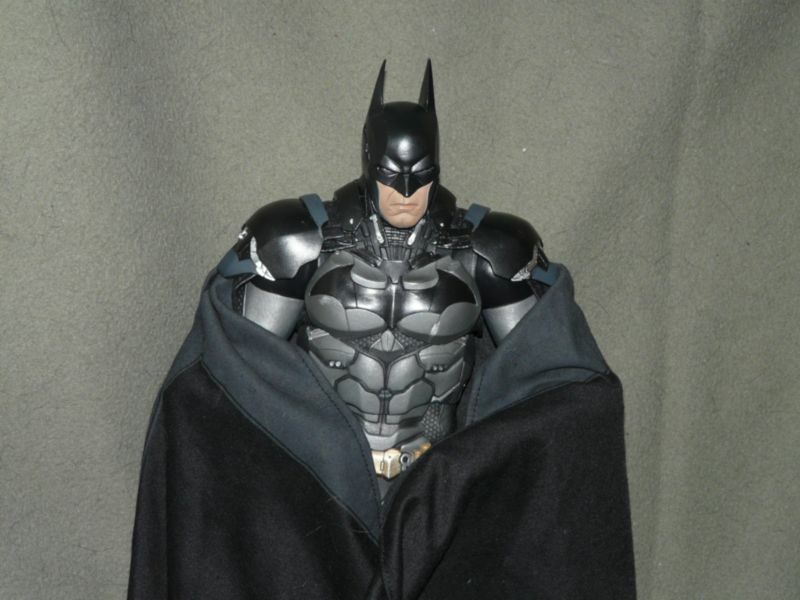 As Batman's batsuit becomes increasingly armor-like, then the figures should be increasingly constructed along the lines of their Iron Man figures. 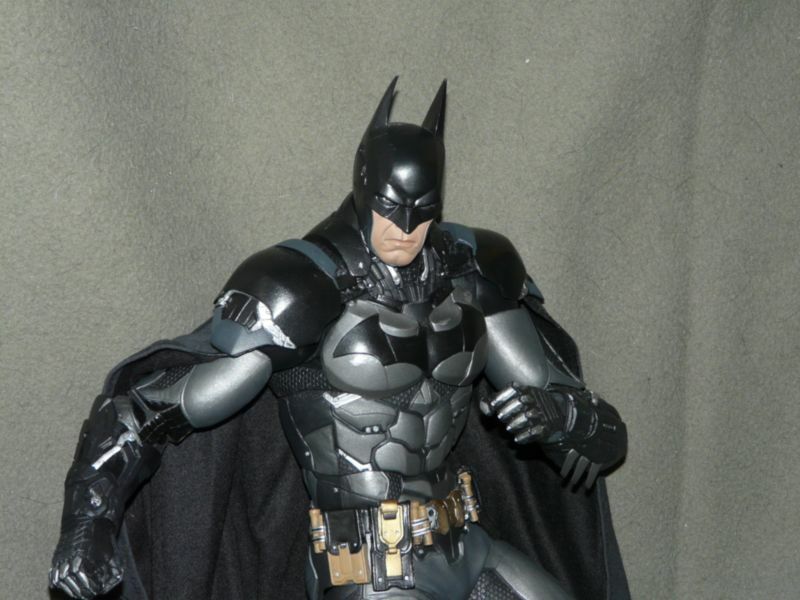 Even with the Bale Batman costume it's a cinch to hide the articulation, and it would give a lot more in the way of posing options. As it stands, I'm bracketing things with my 1/7 scale Play Arts Kai Arkham Knight, and this quarter scale figure. Both are exceptional in their own ways. But both could be demolished in another year if Hot Toys puts their mind to it. Still, in the meantime, enjoy this figure. It's been a long, long time coming. This is a definite contender for "Figure of the Year", even with A:AoU Cap and Groot on the table. - Entertainment Earth is at just $95. - has him for $100, and shipping is a whopping $8. - also has him for $100. 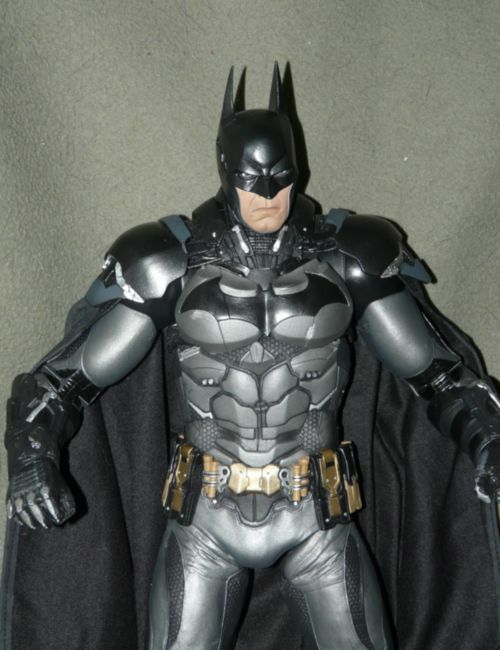 Check out the Hot Toys version of the Arkham City Batman. This product was purchased for the review by the reviewer. Photos and text by Robert the Red.